Bone Rooms is a guide to the world's natural history museums and fossil sites. From Canberra to Berlin, the call of long dead critters has been a passion of mine since I first watched the dinosaurs in Fantasia. Recently I have been lucky enough to visit many of the planets greatest museums...(DONG DONG)...and this is their story. The world’s most famous tyrannosaur has a new home…well, maybe not a new home per-say as the fossils are still housed at Chicago’s Field Museum (FM), but it is now part of a new exhibition – one the designers were determined would reunite all the dinosaurs remains, as previously they were displayed in various locations throughout the FM. I was lucky enough to be part of the FM’s staff event, were the new display was explained to us in detail (and why I believe I’m providing a lot more background information) and the recent Sue media event, when the world’s media got an early look and the chance to film and report on the display before its opening to the public. Sue vs the Field Museum's massive foyer. After receiving a substantial donation from the Kenneth C. Griffin Charitable Fund, the FM set about renovating its prehistoric displays. The first part was moving Sue from the museums’ cathedral like foyer, then replacing the tyrannosaur with a dinosaur that would fit inside this space. 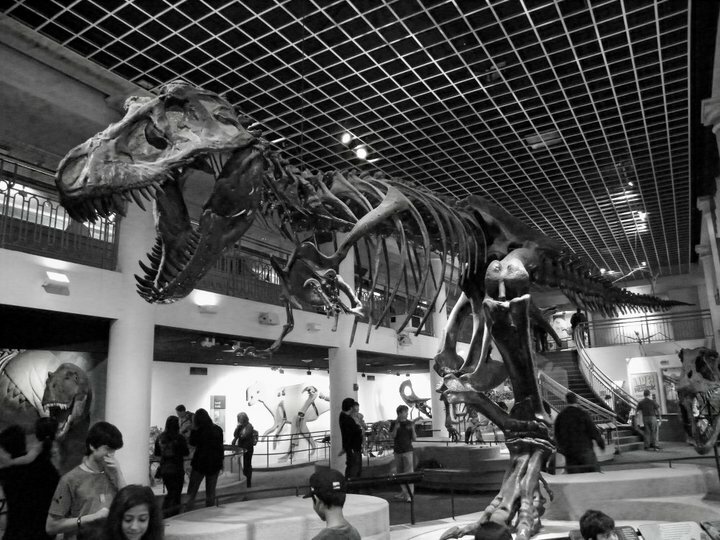 Enter Maximo, the Patagotitan replacement for Sue that now dominates this hall. Yup, Maximo will fit nicely here! Next, after decades of work looking for fossils in Antarctica, the FM used part of this donation to create the Antarctica Dinosaur display that is about to finish its short-term run-in Chicago and head out to museums across the world. And now one of the last parts has been completed (and well ahead of schedule I should point out) with the new Sue exhibition being opened to the public this Friday (the 21st of December). The display is terrific, with a visitor entering through a Cretaceous forest into the exhibition proper, which has been laid out in a strange chronological order. The first fossils you see are containers filled with the tiny pieces of bones that Sue Hendrickson first saw lying on the ground back in 1990. It was by following the trail of these tiny pieces into the nearby cliff-face that led Sue to discovering more bones weathering out of the South Dakota soil. On the wall following has been reprinted the actual charts of how the tyrannosaur was mapped as it lay in the ground. These have not just been reprinted but slightly enhanced as many of the original pencil lines were faint and had faded with age. Not only are they interesting and part of the story, they are also artworks in their own right and deserve their place within the exhibit. This is also a great place to check out something that one might not notice during your first visit…the carpet. To show you the clever way the designers have approached this new display, they had even looked at the flooring and designed it to resemble the sort of lichen that would be found on the rocks of the region…Lichen carpet…amazing. This ‘room’ also contains Sue’s original skull. As this is one of the most studied fossils in the world (as well as being large and fragile), it was decided early on the skull would be placed in a cabinet where visiting paleontologists can always have access to it, rather than mounting it on the rest of the skeleton. With the skull are several loose tyrannosaur teeth, and one clever little feature, a mirrored floor to the cabinet. This allows visitors to see inside the skull at the various features that are almost always hidden from sight with other similar displays. What looks like a wall with a mural is actually a print that, on closer inspection is see through. This means if the lighting is right you can see the Sue skeleton shining through the print and matches up perfectly with the T. rex art work (which I believe was created by Velizar Simeonovski – though I will change this if I’m wrong). Gastralia. These ‘belly-ribs’ are not actually part of the ribcage but are more like the bottom armour seen on turtles. These are rarely displayed, and Sue’s have never been associated with the actual skeleton (previously they were in their own display case one floor above the old exhibit). Right leg. The original display had Sue stepping up onto a ledge, which looked somewhat dramatic but actually meant the right leg was out of position (the knee would have been dislocated when alive). The move meant this issue could be fixed, and Sue’s right leg is now in a far more life-like position. Wishbone. Sue was famous for being one of the first T. rex’s to have an identified wishbone, yet recently the opinion has grown that this bone was actually a stray rib from further back near the legs. Wishbones on other specimens have been found since Sue was put together, and this led to another bone being identified as the correct fossil. Jaw. Though originally not hung incorrectly, the lower jaw has been slung a lot lower. This has given Sue a much larger gape, creating a far more fearsome visage. Shoulders. Both shoulder blades were brought forward and lowered, (jokingly) this means Sue could clap (note- this is not my joke but paleontologist Pete Makovicky’s during our training….so blame him :P ) . Ribcage. The rearrangement of the shoulders meant many other things were changed, including the ribs, which were hung with a greater angle. Previously they were hung horizontally. The new jewel of this exhibit however is the light and sound show that triggers roughly every 15 minutes or so. The lights in the entire room fall, a spot light hits Sue’s skull, creating a Jurassic Park logo like image, which then comes alive. The narrator then goes on to explain a lot about the biology of Sue and many of the visible features, and as it does the specific items mentioned (healed ribs, eye sight etc) are highlighted in one of the cleverest fossil shows I have ever seen. There are similar displays for other dinosaurs (such as the mummified Leonardo at the Children’s Museum in Indianapolis), but nothing this well done. Around Sue are a number of stations with touch screen displays and many of the dinosaur’s fossils cast in bronze for visitors to touch. Behind the tyrannosaur hang a number of panels, roughly 10ft apart that, when you stand in a certain spot line up to create a solid wall. This is the video part of the display, where three different mini-movies play revealing much of Sue’s life story. One is Sue hunting a herd of hadrosaurs, with the actual eating done conveniently off-screen so as not to disturb younger visitors. Another is a possible explanation of how Sue received that horrible leg wound that was likely the cause of death after it grew infected. A feeding triceratops is attacked by Sue, thrilling so many of us who grew up with these two eternal enemies fighting it out in our sandboxes in plastic dinosaur form when we were kids. 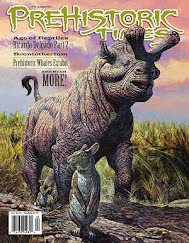 The Triceratops, however, proves to be more than a match for poor ol’ Sue, who receives a nasty wound to the leg. These screens are a clever feature and reveal the depths of forethought that went into this new exhibit. The area is not the largest, and the designers understood the display would be visited by large numbers, so creating a wall that is in fact no wall at all, takes up virtually no space and allows people to walk around and through is simply brilliant. Behind the screens is another dinosaur - that’s correct, its not all about Sue here. The FM’s Triceratops skull sits in its new home, and looks the better for it. Not only has it been raised to eye height, somehow this has made the thing look bigger than its previous home in the FM’s dinosaur hall. There is also a terrific photo here showing how this skull was found in 1904, and you can see it in situ. Behind this is a wide display of many of the fossils that were either found alongside Sue or are known to have lived at the same time – evidence of the world this tyrannosaur lived in. There are plant fossils, pterosaur bones and a few more dinosaur remains. One is the skullcap of a pachycephalosaur, another the armoured scute of an ankylosaur, and their presence explains why both herbivores are featured in the Sue videos. Also sitting serenely in the middle of this display here are two neat little fossils; a bone from a juvenile T.rex. Next to this is a partial fossil from another theropod, Anzu wyliei, the infamous ‘chicken from hell’. The display opens to the public on Friday 21st December 2018 – and numbers are expected to be so high for the first two weeks that entry will be ticketed (free with normal entry). Safety requirements only permit a certain amount of people in the room at the one time, so to ensure this when visitors to the FM arrive, they will be given a ticket with THEIR time stamped on it for their entry. These will be limited in number, so my suggestion is either wait a few weeks or get to the museum early to ensure you can get in. To make sure those who cannot get a ticket can still see Sue, there is a side window where the public can still get a look at the world’s most famous tyrannosaur, but this is not the way you want to see the exhibit- so ARRIVE EARLY! All articles and images are owned by the creator and cannot be used without permission.. Awesome Inc. theme. Powered by Blogger.